On Friday, March 2nd, BirdingIsFun.com contributor Mia McPherson and her bird photographer companion Ron Dudley spotted a Long-tailed Duck along the Antelope Island Causeway. Long-tailed Ducks, I understand, are seen almost annually in the Great Salt Lake, but I had not seen one in Utah yet and this was the first report of one this year in the area. My awesome wife consented to start our regular Friday night date with a quick trip out to see this duck. (I've had great improvements since this incident and she has been very supportive when she can sense that I am particularly excited about something birdy.) Now I had once before seen a Long-tailed Duck...in Idaho...way out on Lake Lowell...with only binoculars...so far out that I could only see a whitish duck with a black patch on its cheek...granting me a life bird...but such pathetic views that I was left wanting. Thanks to Mia and Ron, I finally got that "soul satisfying view". Rob Fergus' recent post here, Daily Birding Badges, inspired me with ideas of creating a few shareable birding badges of my own. After finally getting a soul satisfying view of the Long-tailed Duck, I dreamed up using Jack Black as Brad Harris in The Big Year movie celebrating having seen the Himalayan Snowcock and having survived the death-defying helicopter ride. Thanks to Nate Swick for introducing me to the terminology for this concept of SSV that I have known so well for these many years. P.S. On a less satisfying note, the poor little Long-tailed Duck has only been seen drifting along, never diving, never flying, not even preening. This level of lethargy is disturbing and means that it is either exhausted after its errant trip inland from the sea, or it is on death's door step. I hope it recovers and lives a long full life, and that it'll stop in and visit us in Salt Lake with more of his buddies more frequently. Update: On Saturday, March 3rd, fellow Utah birders report that the lethargic Long-tailed Duck had been attacked and dragged around by a Northern Harrier and then consumed by said Harrier. Ahh...the circle of life! How beautiful and also how very sad. The images show such a lovely bird, but the eye closed evidently shows it has something going on and I do hope that someone in wildlife management can get to it and check on it...it may just have something caught in it's mouth, or leg that is not seen. Glad you got those images! Mary, you might have missed the very last sentence if the post. That long-tailed duck is now sustaining a Harrier and whatever other critters that feasted on the carcass. In this way the circle of life is glorious and beautiful... But I am a little sad for the duck. Lucky you, but not so lucky duck. I once got incredible close-up photos of a Lazuli Bunting that was caught in a May snow storm. It was lethargic on a rock in my backyard and later died. I do have a kind of tarnished sentiment when I see the photos, and I kinda feel the same way about this Long-tailed Duck. Yet, I'm powerless to have changed the scenario, so I simply accept nature as it is. By the way, whether you intended it or not, nice play on the English language idiom "lucky duck". So glad for your wonderful views (awesome photos too). Love the Badge! Sad to hear of it's demise. Thanks Dan. 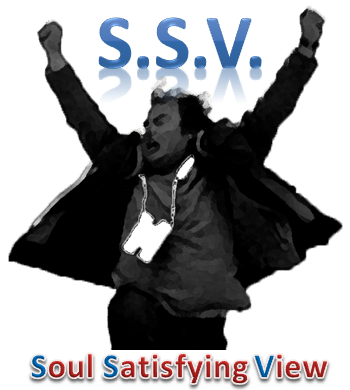 I think I'll drop the "Soul Satisfying View" verbiage from below the badge once it seems like most birders understand what SSV stands for. Oh, I did miss the last sentence...life in nature. Glad you got those special images, even more now!!! Robert, yesterday Ron and I located the remains of the Long-tailed Duck along the causeway and the reason I spotted it was because a Northern Harrier was still feeding on it. I felt sad that the duck died but I was glad that the cycle of life continued. It was awesome to spot the duck and even more awesome that many of the local birders and bird photographers got to see the Long-tailed Duck. Actually, I am glad to hear your report Mia. It gives us all "closure" to the Long-tailed Duck's short saga with us over last weekend. Thanks for finding it and sharing your sighting and granting me that SSV before it was too late. I spotted my first Long-tailed Duck around this time last year. What a beautiful sight! So glad you finally got that "Soul Satisfying View". I was saddened to read about the end of this lovely little duck. The Long-Tailed ducks are beautiful. Great photo! I was so hoping that the continually half closed eyes on this duck when Mia and I first spotted it were indicitive of some sort of ecstasy, having completed it's journey to the GSL after that intense storm. Sadly, it wasn't to be and it was difficult to view the remains of the bird a couple of days later but at least the harrier and possibly others benefited. Robert, I'm glad you & some others got to see this guy before he met his demise! You got some beautiful shots! Some of our local birders spotted a Long-tailed Duck in our area (Louisville, KY) on the Ohio River last winter, but I never got to see it. I ran down there as soon as I saw the report! As much as I love nature, I do hate the death part, but he may have been suffering in some way, so for him, it may have been a blessing! Sorry to hear about the birds demise~ Such is life! Great shots..happy you had your moments with this bird! What a beautiful bird -- and simultaneously sad trajectory. I, too, am glad to have heard the whole story, thanks to Mia and Ron. I find it impossible to detach from the animals I regularly photograph ... so, I can relate to Roherbot's sentiments about the home hummingbirds. And can imagine the difficulty of coming up on the scene.